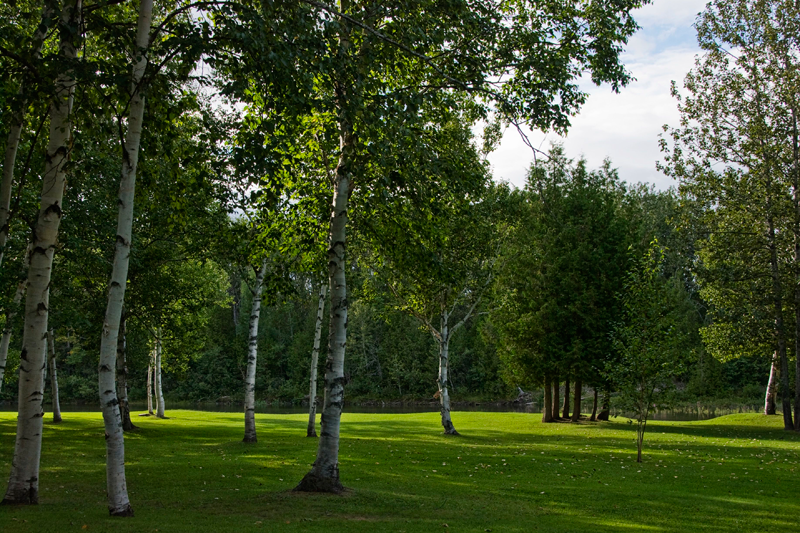 Camp Bonaventure has been described as one of the finest sporting lodges in North America. Designed with your every convenience in mind and built to satisfy the most discriminating sporting requirements. 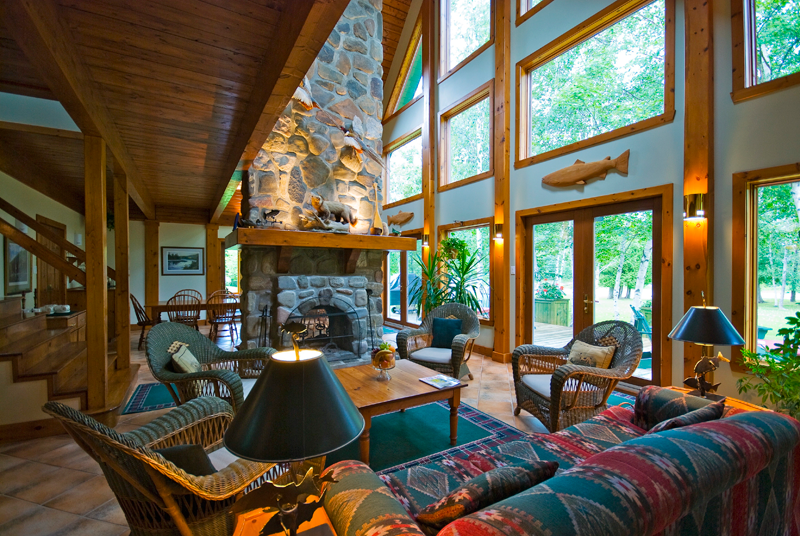 Our main lodge provides the perfect setting for your fly fishing vacation – a laid back and relaxing atmosphere. Featuring spacious and comfortably appointed living room and dining room with thirty foot river-stone fireplaces. In the living room is a fully equipped fly-tying desk where you can create the perfect fly for your next day’s adventure. Our large deck overlooking the river is just the right place to enjoy a morning coffee or night-cap underneath the stars, while fishing tales are told. With four comfortably appointed guest rooms, each with a private bath and screened porch, our main lodge provides accommodations for up to eight guests. In addition to the main lodge our private guest house is perfect for a family of four, two couples or a business trip of four associates who are seeking a little more privacy. Designed for quiet and relaxation it features a spacious private living room with a huge thirty foot fireplace, two spacious bedrooms with private baths and screened porches, and a wonderful patio complete with Adirondack chairs. No need to come to the main lodge before breakfast or dinner as our staff delivers fresh coffee and juice in the morning and hors d’oeuvres before dinner. For your convenience we offer free high-speed wireless access for all our guests. A computer for checking e-mail or sending fish bragging photos is available for your use in the main lodge. Our convenient and well designed rod room is where you keep your fishing equipment and meet your guide in the morning. Located in a separate building its where the action takes place. Features include private storage areas for each angler’s gear and waders, a rod rack that can accommodate even a 15-foot spey rod, and a radiant heating system that will dry gear overnight. The rod room always has fresh coffee in the morning and cool drinks when you return after your day on the river. Your Camp Bonaventure adventure is perfectly complemented by the enjoyment of fine dining. Our chef’s menu boasts fresh local seafood, prime beef and many other mouth-watering creations. Breakfasts feature all of your favorites including homemade wild berry jams, local maple syrup and fresh breads baked daily. Lunch, on the river or back at the lodge, is an experience in its self. Before dinner enjoy tasty appetizers with your favorite drink. Evening dinner is served in our dining room overlooking the beautiful Bonaventure river. Gathering in front of an open fireplace and enjoying an elegant meal is always a fitting way to complement a memorable day. Wine is included with lunch and diner. Alcohol is not included however guests are welcome to bring their own. At our bar in the main lodge and guest house you will find all the necessary ingredients for the perfect drink. We are a short distance from a very well stocked liquor store. Fine dining, superb accommodations and great service are hallmarks of the Camp Bonaventure experience.